Good morning! Thank you to for all of your sweet messages yesterday on the bathroom refresh design inspiration board. I am so excited to get another room knocked off the list here. (and let’s be honest, have a reason to stay focused.) Today I am joining a big group of bloggers to share some spring home inspiration and I am sharing some spring porch ideas. If you are coming over from Home Made by Carmona– welcome! Well, the birds are chirping and it’s not pitch black at the bus stop anymore! Spring is in the air and I for one cannot wait to say goodbye to old man winter. I am definitely happy to be springing forward this weekend because that means we are closer to those long days of summahhhhhhhhhhhhh! But with the promise of warmer days and some porch sitting, I knew that the porch needed a little loving. The first order of business was a new welcome mat. And I knew EXACTLY what I wanted for the spring porch. Next order of business was filling the empty planters. Because the thing worse than dead plants in planters is empty planters. I found these Rosemary plants at Home Depot and love how they look for spring! I swapped out the little end table for one we are no longer using in the foyer and added a few spring touches. Some fresh flowers from Trader Joes instantly gave this porch new life. Sweet tea, spring temperatures and Southern Living on the porch! YES PLEASE! OOOH! The next order of business is another fave of mine. Ever since I took down the Christmas wreath I had been considering a plain moss wreath for the front porch. So I made one. I love how classic it is, and I think it is perfect for any season with different ribbon. This was a DIY and I love the way it turned out. I got the wreath form and moss from Hobby Lobby along with the fun blue gingham ribbon. Click here for the full DIY Moss Wreath Tutorial. Sweet P and I sat out on the porch this morning waiting for the bus. Instead of sweet tea, I had my trusted coffee in hand. And it felt perfectly spring sitting in these chairs! I hope you found a few spring porch ideas for your own home! 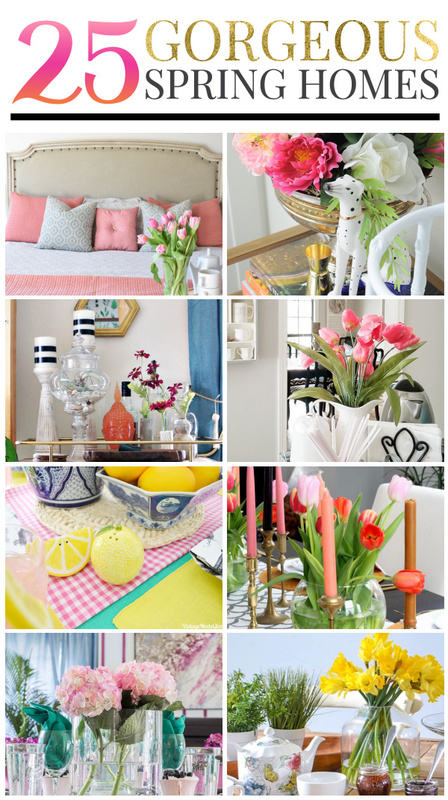 If you want lots of spring inspiration, be sure to check out all of the other talented bloggers sharing their spring homes below. love your layered door mats and the pops of blue, my favorite color! Such a pretty front porch, Heather! It’s snowing here in Massachusetts today so sweet tea and Southern Living out here sound especially enticing! Love your pops of blue and the rosemary in your planters! So chic and inviting! Love the door mats! Love love love that chinosierie stool. I am in desperate want of one, might have to come take yours! The blue, green, and pop of yellow with the sweet tea are perfectly spring! Great tour and I love the idea of layering the door mat. I have one I love that is a bit too small, but I love this solution to make it work! Love your porch with all the pops of blue! So fresh for spring. I just love that gingham doormat, and what a bargain! Your porch has me longing for warmer weather so that I can get my front porch spruced up for spring. It’s perfect! Love the layered mat. Such an inviting space. Well done. Your mats are so good and I love your Rosemary pots and DIY wreath! I’d be out there waiting for the bus with my coffee or tea, too, if I were you. LoVE! OMIGOSH your front porch is precious!!! I can’t wait for summaaahhh!!! Super cute porch styling!! I love the layered mats with the blue buffalo check and the moss wreath is beautiful. I’m totally with you on enjoying sunlight at the bus stop in the mornings now! I love your buffalo check mat, I actually have the same one myself! Loved your front porch Spring refresh! Totally fabulous. I love it! Your front porch is so fabulous, until I will try and copy your idea. I love it, and thank you so much for sharing.